30 Minute Vegan Ramen with homemade broth.. sounds too good to be true right? I used to think so, at least the first few times I tested this recipe. But I finally cracked the code! Turns out, vegan ramen CAN be made in 30 minutes. Including the broth AND the toppings. If that’s not cause for celebration, I don’t know what is! This vegan ramen recipe is modeled after my absolute favorite vegan ramen spot in LA! It’s called Ramen Hood and it is aaaaaaaamazing. They serve their vegan ramen with these incredibly realistic looking vegan hard boiled eggs. They’re crazy fancy and look amazing but I don’t have the time, patience, or desire to recreate them. The broth on the other hand, now THAT was my mission. Parking in Downtown LA is seriously limited. As much as I love Ramen Hood, I had to learn to make it myself to avoid the hassle. As a further challenge, I decided my recipe had to be ready in just 30 minutes. I know most people don’t have 3 0r 4 hours to let the broth simmer and I really love making recipes that are simple and easy to prepare. It took a few tries, but the verdict? WORTH IT! My first few attempts at 30 Minute vegan ramen kinda bummed me out. Either it was too creamy (normally there’s never such a thing but creamy ramen is SUPER weird) or it took wayyyyy longer than 30 minutes. If you try this vegan ramen recipe, rate it in the comments and let us know how yours turned out! While you’re at it, tag a photo with #carrotsandflowers on Instagram so we can admire your handiwork! 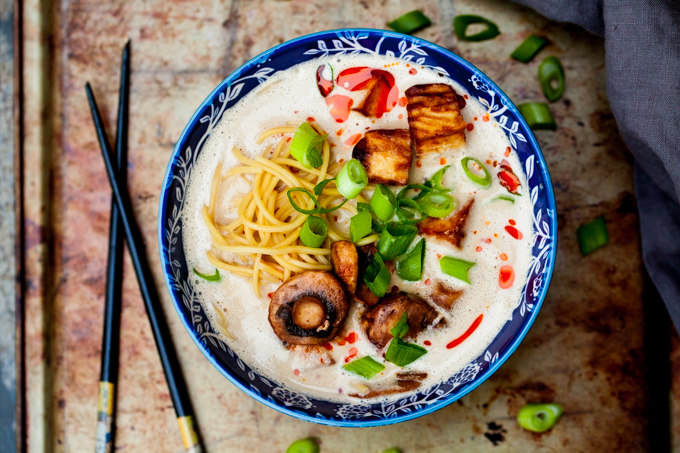 This most incredible homemade vegan ramen is ready in just 30 minutes! All of the flavor with none of the wait, this is a must try! Carefully press as much water as you can from the tofu while keeping its shape. Cut the tofu into 1 inch cubes. In a small bowl, toss the cubes with 1 tsp cornstarch then add 2 Tbsp tamari or soy and coat evenly. Bake the tofu on a sheet lined with parchment paper at 400F for 20 minutes. Flip halfway through. While the tofu is baking, bring a pot of water to boil and add the ramen noodles. Cook according to package instructions (about 4-5 minutes) Drain and set aside. Heat 1 tsp sesame oil in a skillet on medium high heat. Add the mushrooms, corn and 1 Tbsp tamari or soy. Cook for 3-4 minutes until the mushrooms darken. Transfer the contents of the skillet to a small bowl. Set aside. Heat 2 tsp sesame oil in the skillet on medium heat. Add the shallots and garlic and sauté for 3-4 minutes then transfer the contents of the skillet to the blender. Add the mushroom broth, sunflower seeds, miso, nutritional yeast, 1 Tbsp soy or tamari, 2 tsp sesame oil, chili oil, red pepper flakes, and minced ginger. Blend on high until the mixture is smooth, about 3 minutes. Heat the broth in a saucepan until hot, then divide into 3 bowls. Fill each bowl with noodles and top with tofu and vegetables. Garnish with chopped scallions and ½ tsp chili oil. *Broth can be batched and stored in the freezer for up to 2 weeks. Thaw in the fridge before reheating. *Mushroom broth can be found at most health food stores. It's a bit pricier but super worth it! Using vegetable broth instead of mushroom broth will change the flavor and is not recommended. In a pinch, miso ginger broth is a better substitution. For more deliciously simple recipes like this vegan ramen, check out our Vegan Tomato Spicy Tuna Sushi or our Portobello Veggie Fajitas with Easy Guacamole! To save this recipe for later, simply pin the photo below! Sweet! Hope you love it, it’s definitely my new fav! sorry, I meant POWDER form! It’s a liquid. 32 ounces, so you might need more than one container. Pacific Foods makes a really good one and is available in most natural food stores. I loved this and I could not find vegan mushroom broth at “Fresh Thyme Market” so I used Better Than Bouillon Vegetable Broth and thought it was fantastic. If mushroom broth would make it better I can’t wait to try. The Better Than Boullion Vegetable Broth did make it too salty though. Next time I would cut back on the # of spoons of the broth base to water. So happy you enjoyed it! The mushroom broth will definitely add to to the flavor if you can find it. The vegetable broth base can definitely make it too salty especially with the amount of miso in the recipe. If you can find dried mushrooms, you can pulverize them in a food processor and use a few tablespoons with 4 cups of water. That should make a simple mushroom broth that tastes good! I stumbled across your blog on Facebook and oh my, your recipes look bomb.com! I’ve pinned so many of them already and can’t wait to try them all! I could use a warm bowl of this ramen right about now. I’ve been wanting some homemade miso! What I can I substitute for sunflower seeds? Can I use pumpkin seeds or sesame seeds or will this intensely affect the flavor? Thank you! I definitely do not recommend using sesame seeds as they have a strong flavor. Roasted pumpkin seeds could work but they are not as soft as sunflower seeds so you may have to strain the broth. What brand noodle do you use? Didn’t see any water in the recipe. It’s not a mushroom broth, it’s a paste. I use a liquid mushroom broth in this recipe. 🙂 4 cups. This is the best! I’ve made it twice now – so easy and love the incorporation of sunflower seeds for some extra protein 🙂 thanks! In your video, you use 3/4 c roast sunflower seeds. In the printed recipe here, you call for 1/4 c. Which do you recommend? i really enjoyed this recipe- it’s rich and complex like a really good pork ramen. the next time i make this, i may cut the amount of sunflowers seeds in half as i felt it was too rick and creamy…otherwise, loved it! thank you! I am so happy to hear that! Thanks for sharing Hannah! Is it white miso in your recipe ? Hi I have a question about the recipe. How important is the nutritional yeast to the flavor and what type of flavor does it add? Would it be ok if I left it out or is it vital? And what kind of miso did you use, white or yellow? Thanks in advance! Can’t wait to make this, sounds amaaazing!! I am not known for cooking but I was encouraged by how easy it looked and I do not regret anything! This was easy to make once I found all the ingredients, quick and extremely tasty. No more waiting in line for this dish at a popular noodle place! It hit all the umami flavors. The only thing is I should have listened to the 4 minutes in the blender. Do not skimp on this. I did a do-over to get the texture right. I also have a question about what miso to use since I am not familiar with them. My dish came out a little bit more yellow than beige. I can’t thank you enough for sharing this! Delicious. Visited LA in February. Loved the vegan ramen at ramenhood. Tried your recipe tonight. As close to being there as it gets. Prefer without tofu. This recipe satisfies my Ramen Hood cravings completely! It’s so delicious and easy that my partner and I have made it several times now. I’ve started using a 1/2 cup of sunflower seeds and find that it’s the perfect balance of creaminess. We also add sautéed kale and roasted corn. I would love to make this but I don’t have sunflower seeds. Could I omit them or substitute with soaked cashews?